Watch brand Montblanc has developed an interactive application Timepieces iPad App, allowing to plunge into the world of watchmaking brand. Application developed by the company as a significant resource for watch enthusiasts and collectors out details of the most complex calibres hour mark, the history of their creation and features unique details about one of the models that will be presented this year. With the latest technology, a new application for the iPad Montblanc contains detailed information on 40 selected hour mark. Additionally, the application allows you to travel on two workshops in Montblanc Le Locle in Switzerland and Vilre, urban centers of watchmaking and the best of its traditions and innovations. The application encompasses announcement recently presented at the annual SIHH 2013 models Nicolas Rieussec Rising Hours. Additional applications include headings spectacular 3D-panorama of the flagship models of the brand both outside and inside. Application features – dynamic, as a permanent mark of his plans to update the new clock and a detailed history of their creation. 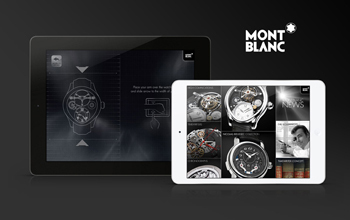 Montblanc app for iPad includes a feature True View, which allows you to “try on” a variety of models of the brand. The user must only measure your wrist. If the watch is perfect sitting on the arm, the virtual experience can become real with the pointer branded stores.